Prairie grain growers doing business with Glencore Agriculture’s Viterra arm can now create their own grain contracts with the company anytime online. In what it describes as the “first and only full range” of online contracting options for farmers in Western Canada, Viterra launched its new system on its myViterra platform in December. 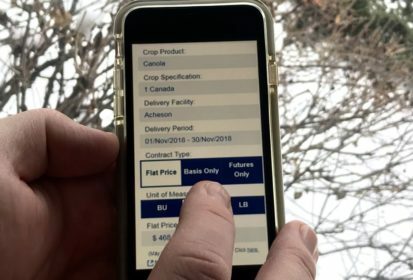 A Prairie grain grower with a myViterra account can use the online option to create basis, flat priced and fixed futures contracts, either on a desktop or smartphone. The company has previously offered online target pricing, but the latest version of the system allows a producer to complete a contract “on your own time, online, 24/7,” according to Jeff Cockwill, Viterra’s director of corporate affairs. As with the company’s online target pricing system, when a grower signs into the myViterra system, he or she has the authentication necessary to enter a binding contract. The online contracting system also includes tonnage limits, if need be, to keep a reasonable ceiling on the risk exposure Viterra can accept from any one myViterra account holder. While the myViterra platform has been up and running since 2008, Viterra staff have been talking about the possibilities of a full online contracting option for about five years, Cockwill said. Viterra’s understanding is that the option of a “full contracting suite” where a grower can go online to sell grain at a specific price for a specific month is the first of its kind on offer from a Prairie grain firm.